Soak chana overnight or at least for 4 hours. Cut the tomatoes in cubes and puree them by adding little water. Keep it aside. Heat oil in a pressure cooker. Add mustard seeds, cumin seeds, pinch of asafoetida and bay leaves. Let them splutter. Add chopped onion and saute till slight brown color. Add ginger and garlic and saute till raw smell goes away. It will take few seconds. Add tomato puree and mix well. Let it cook till moisture evaporates. It will take around 6-8 minutes. Keep stirring in between. 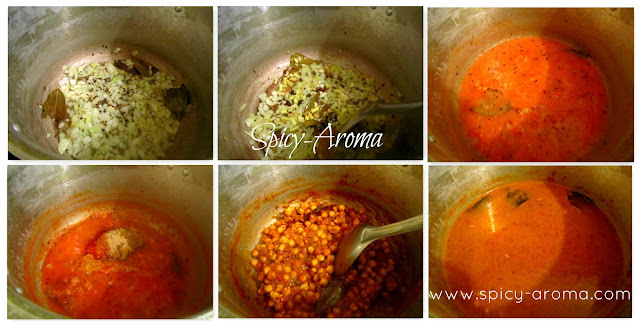 Add red chili powder, turmeric powder, coriander powder, cumin powder, dry mango powder, garam masala and salt to taste. Mix well and cook till oil starts to separate from spices. 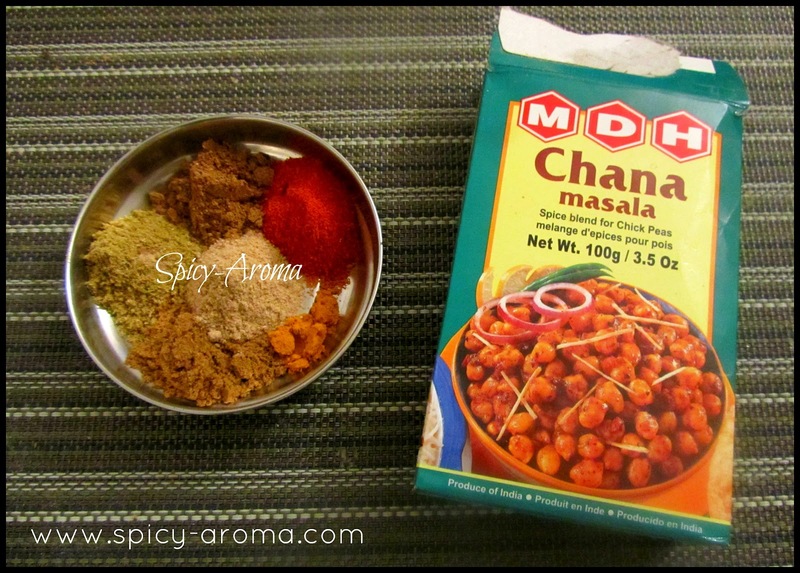 If you are using store bought chana masala, then skip adding above spices. Just add red chili powder, 2-3 tsp chana masala and salt to taste. Add soaked chana and 3 cups of water (add more water if you want thin gravy). Mix well and cover the lid of pressure cooker. Cook till 7-8 whistles. Once the pressure goes away, open the lid. Add little lemon juice and garnish with cilantro. Serve hot with Bhatura or any Indian flat bread. 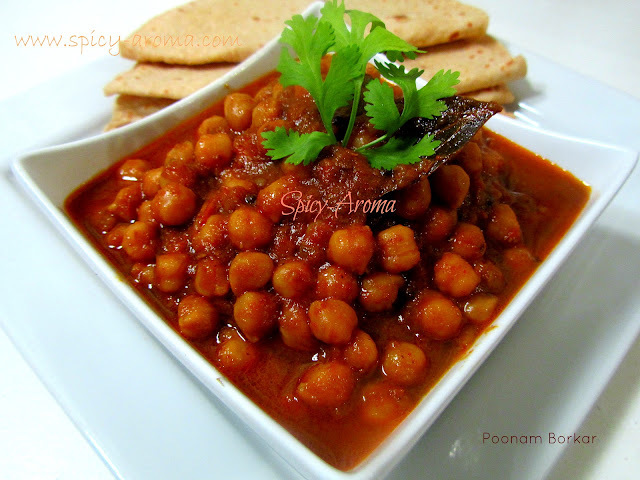 Hello dear...channa masala looks very delicious. Excellent seductive and great side dish with rotis !! 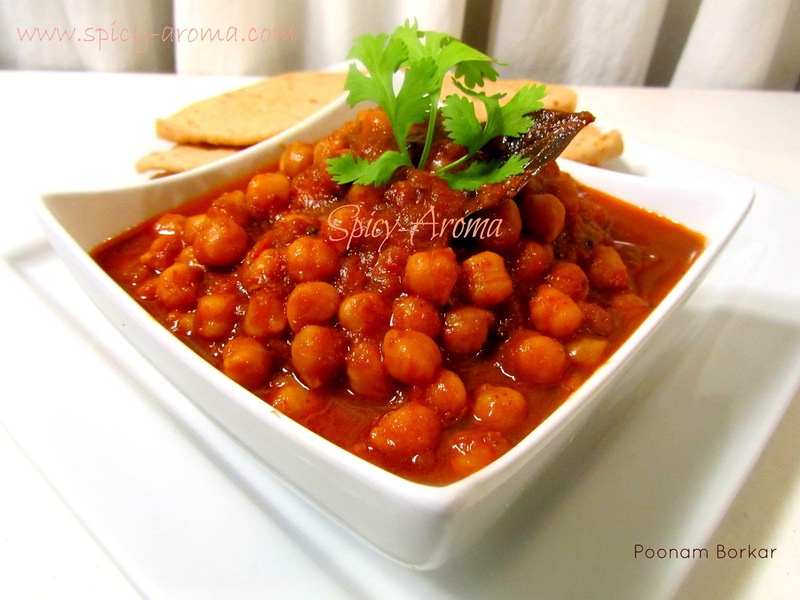 chole masala sounds so dleicious, indeed a quick recipe...very tempting clicks dear! Lovely colour of the chickpea curry. The pressure cooker does the magic and they make the channa taste awesome the next day. I love the color of your channa. Love bhature and channa masala anytime,irresistible masala. My fav side dish for rotis!! Looks colourful and great pics! wow....the dish looks fabulous...nice presentation !!!! Hi.. can you please create a print version of your recipes ? That way I can print just the relevant part and stick it on my fridge.